A study by researchers from the Centre for Health Policy titled ‘Revisiting the Christmas holiday effect in the southern hemisphere’ has been referred to by media outlets around the world. The study was published just before Christmas in the Journal of the American Heart Association. It referred to 25 years of mortality records from New Zealand to show that cardiac-related deaths are higher during the Christmas holidays relative to the rest of summer. 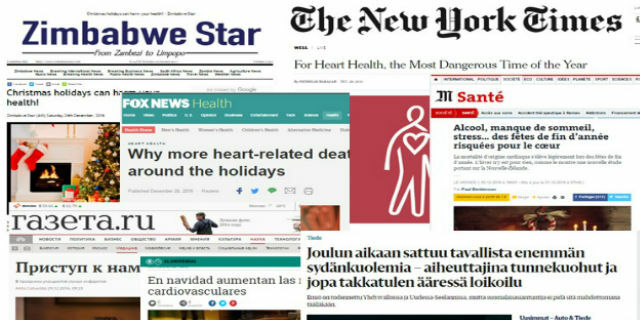 The results are consistent with a previous US study looking at the Christmas holidays during winter, adding evidence that Christmas holidays do elevate cardiac mortality regardless of the season. Zimbabwe Star Christmas holidays can harm your health! Its impact can be tracked via an Altmetrics score. Altmetrics tracks the impact of publications both in news reports and a wide range of social media. The study has an Altmetric score above 850. Its high score means that it is ranked in the top 2000 articles of the 7 million publications tracked by Altmetrics in terms of its impact on news and social media.